Aerosmith guitarist Joe Perry has revealed that the Boston rockers will host a Las Vegas residency next spring. Best Classic Bands reports the legendary rocker shared the news – ahead of an official announcement set to take place during the group’s August 15 appearance on NBC-TV's Today Show – during an August 8 interview on SiriusXM’s The Beatles Channel. “We’re going to be doing a residency in Vegas starting next spring,” Perry told Fab Forum host Dennis Elsas. “What we want to do is something that I haven’t seen before… just downsizing our live show, just playing in a smaller place. We want to do something different. We’re in the middle of the production now. What we’re talking about is having an experience that you wouldn’t be able to see on a regular Aerosmith tour. The upcoming NBC television appearance will mark Aerosmith’s second live performance of 2018, following a May show at the New Orleans Jazz & Heritage Festival. 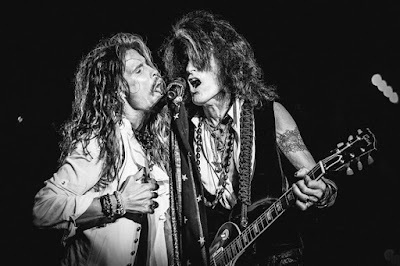 Both Perry and frontman Steven Tyler have been active with solo shows and tours this year, with the guitarist doing double-duty on the road with The Hollywood Vampires. Tyler premiered his documentary, “Out On a Limb”, at the 49th Nashville Film Festival in May, while Perry released a new solo album, “Sweetzerland Manifesto”, in January.